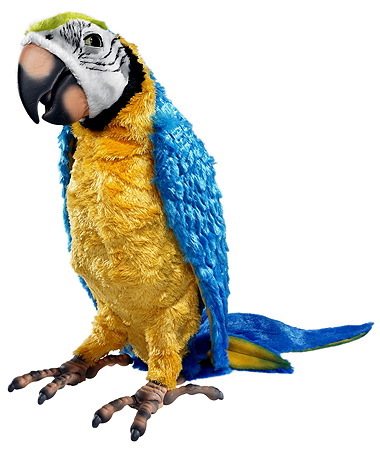 Squawkers McCaw is the latest Fur Real friend from Hasbro to hit the skies, and for a robotic parrot he’s very realistic and a ton of fun. Full video review with the feline reaction (i.e. my cat attacking him) above. If your ADD is in full effect today you can skip the video to find all the pros and cons about this cool new toy from Hasbro after the jump. Fully customizable with command/responses in your own voice. Looks almost like a real parrot. Rubber cracker looks good enough to eat. Mode and power switches are in the back and are hard to get at. Beak sensor doesn’t always register when the cracker is there. Eyes click loudly when he blinks. Wing movements could be a little more pronounced. Squawkers McCaw is a refreshing change from all the sleek, hard plastic robots to come out in recent memory. He’s got a fun little personality too, and his advanced programming makes what he says fully customizable in your own voice. For a robotic bird that doesn’t actually walk or fly, he’s a ton of fun. We think Squawkers will be one of the hot toys this Christmas, and he’s GadgetMadness Approved. i just love those parrots! !